Yes, I have an iPhone. How sad is that? Well, my hand was forced last year when I came back from my Australian vacation and discovered that both my five-year-old mobile phone and my seven-year-old Palm Pilot no longer worked properly (I guess I was surprised they still worked at all, but never mind). So far, no regrets. 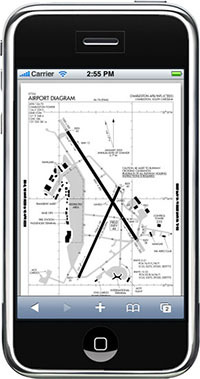 But it's not the iPhone that's the subject of this posting, it's ForeFlight for the iPhone, a great little flight planning application from fellow bloggers Vectors To Final. I've actually had the app for quite a while now and have been meaning to review (or at least mention) it here for ages, so my apologies to the ForeFlight crew for leaving it so late (and no, no one from ForeFlight has vetted this article or probably even knows I exist, in case you were wondering). And note: all screenshots shown here were stolen shamelessly from the ForeFlight web site, and do not necessarily represent the latest version of the software, etc. In short, I like ForeFlight a lot, and would recommend it quite strongly if, like me, you have an iPhone, you fly VFR or IFR in the US (I do both), and you're realistic about some of the inherent limitations of any current iPhone app (think: you must be in range of WiFi or AT&T's Edge network in the US). It basically does most of what I want a flight planning app to do on my iPhone, and does it well; it doesn't entirely replace DUATS access (which I also have on my iPhone), but it's certainly complemented DUATS with a bunch of nice features (approach plates, airport information, etc. ), and made DUATS feel clunky and graceless by comparison; it's also entirely replaced the A/FD for me. No, it doesn't do NOTAMS, but it can file flight plans. Anyway, I'll let the extensive ForeFlight web site speak for itself about features, pricing, etc. (take a good look at the screen shots for an idea of what it can do), and simply discuss what I think are the good and bad sides of the app, and illustrate how I use it to give you some idea of why it's useful. ), and for prepping approaches informally before flying when you don't have the plates handy. And it'll let you file that last-minute flight plan, as long as you have a DUATS account. Secondly, it's a good combination of information sources: a really convenient and well-presented subset of DUATS and the full AF/D. It's the presentation that makes all the difference to me: yes, I can read raw METARs and TAFs, and even the AF/D, but it's nice to see it in legible and nicely-formatted plain language, and in a package and layout that's intuitively easy to use and navigate. 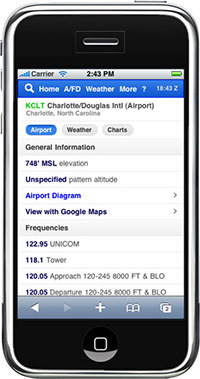 The information presented for each airport typically includes weather information, airport information (runway lengths, airport diagram if there is one, frequencies, etc. ), chart abstracts, and full approach plates, at least. Thirdly, it's nicely integrated into the iPhone. As described below, you can display the airport on Google Maps or call an ATIS or AWOS number with a single touch of the screen, and, being an iPhone app, it's just easy to use  the full power of the iPhone's gestural interface works nicely with ForeFlight (OK, I'm starting to sound like an iPhone Bore, so I'll just keep that part suppressed). I'm at Oakland airport (KOAK), next to Cessna 83Y, doing final work for an informal VFR fun flight. We've done the pre-flight, we've agreed on where we're going (Groveland / Pine Mountain Lake, E45), and it's time to do a final weather check (it's been an hour or two since I did a full DUATS check). Firstly, what's the current weather at E45? I pull out the iPhone, access the quasi-public WiFi mysteriously available at the hangars, fire up ForeFlight on my browser, log in if I haven't logged in lately, and enter E45 for the airport. A few seconds later ForeFlight's got a nice screen with airport details (runways, altitude, location, frequencies, etc.) for Pine Mountain airport. I show the page to my copilot so she's familiar with the details (it's a tiny place, so there's not a lot to see :-)). I touch the link that says "View with Google Maps" to bring up a separate Google Maps page that I use to show my copilot the general vicinity of the airport. I also touch the "Charts" button to bring up a page showing the VFR and IFR chart extracts for the immediately surrounding area. I also touch the "Approaches" button to see the available approaches; I touch the one I want, and, voila, the relevant NACO plate is displayed, scalable and browsable like any other page on the iPhone (using the iPhone's excellent gestural interface). Very nice... and basically a convenient hand-held web-based combination of the old paper Blue Book, the AF/D, and some useful bits of DUATS. ). Luckily, although there's no public WiFi at the airport (well, none that I'm going to hack into, anyway :-)), the iPhone's AT&T Edge network's available, and while it's quite a lot slower than WiFi, I'm able to use ForeFlight in the iPhone browser pretty much as described above. This time, though, since it's Oakland, there's copious weather details available on a separate linked ForeFlight page, including weather radar, plain English METARs, TAFs for the next day or so, etc.  i.e. pretty much what you'd see in DUATS, and really just what you need to make a decision at this distance on a day and flight like this. Again, note that none of this replaces full DUATS briefings, or having real charts or approach plates available, but if you're hanging around an airport or somewhere where you want to get a spot check on the weather or your destination's runways, airport diagram, etc., and you've got an iPhone, and there's public WiFi or the Edge network available, it's a great resource. Nice review. I'm waiting for the new iPhone to come out before I join the mad crowd of iPhone users but this app looks like a great addition to flight awareness. And, hopefully, we'll see more flying apps once the SDK is released. Paul. Thanks for the review! We're always excited to hear about how pilots are using the app and that it helps make gathering preflight intelligence a bit less clunky. Paul  thanks for the comments. Yes, I'm hoping that with the SDK ForeFlight will start including off-line things like weight and balance and a selected version of the AF/D, approach plates, etc. Tyson  thanks for the mention! It makes me realise I need to update that photo of me on my splash page :-).